Qualmark endorsed visitor activity. Levelled by an earthquake and the resulting fire in 1931, and rebuilt in the depths of the great depression, Napier is one of the world’s most unique and stylish cities. 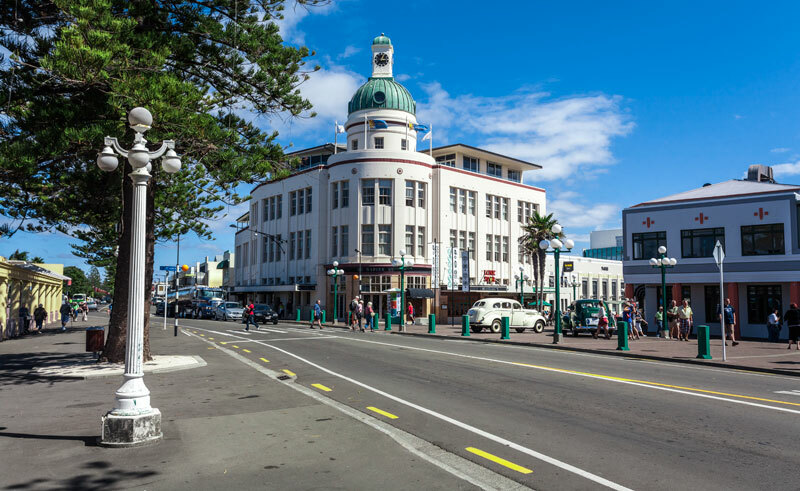 Immerse yourself in Napier, the Art Deco Capital of the World! Take a tour of the city’s iconic Art Deco heritage which is beautifully preserved and celebrated by the Art Deco Trust. Your local guide will tell you stories of the earthquake that destroyed the city, the people that were affected and the remarkable recovery and rebuild that was completed in just two years. With a tour to suit everyone, you will see a new side to Napier’s beauty and charm. Be sure to visit the Art Deco Centre, your one-stop shop for all things Deco! Napier in February is a magical experience when the Art Deco period is revived and Napier, the Art Deco Capital is transported back in time. The Art Deco Weekend is a fantastic festival where feather boas and boater hats are the norm and hundreds of vintage cars are on display. Join the thousands people who flock to Napier to enjoy the glitz, glamour and entertainment of the world-renowned Art Deco Weekend. The tour finishes at the Deco Shop and is followed by an optional viewing of a 20 minute movie and a complimentary cup of tea or coffee.